Jared McIntosh takes a great deal of pride in the lawns of his customers. As Operations Manager for TurfMan, LLC, a Cincinnati, OH-based LCO, he is a part of an organization that prides itself on quality of service and customer satisfaction. Although 2018 started like recent years, Jared quickly realized something was different. The last few springs in Cincinnati, with low humidity and typical spring-like temperatures, had been ideal for disease prevention and the maintenance of healthy lawns. 2018 proved to be a different animal, altogether. By the second week of May, Cincinnati had already hit 90 degrees, days were dry, nights were wet, and the humidity and dew points were both considerably higher than normal. This dangerous combination brought with it an outbreak of brown patch, much earlier than McIntosh expected. Pictured above is a turfgrass leaf blade with a brown patch lesion present. The irregular shape of the patch, along with the tan margin, help in disease identification. As part of its TurfMan Plus Program, TurfMan typically takes a preventative approach to disease control, providing customers with an early-May application of Prophesy® fungicide, just ahead of the point in the season that would typically bring conditions ideal for the spread of brown patch. 2018 has thrown that completely out of whack, as the conditions had allowed brown patch to rear its ugly head before the TurfMan team could get out ahead of it. The problem was widespread. As McIntosh explains, "the majority of our lawns are fescue, and it seems like everyone's got a brown patch issue this year. I'd estimate that 80% of our customers have brown patch." With brown patch spread throughout their service area, TurfMan has been forced to go out with a curative program. Brown patch typically shows up as a circular patch, but can also have less defined margins, as seen in the front of the photograph. Curative programs certainly aren't ideal. "We never like to be in a curative mode," McIntosh explains. "In these situations, we're charging customers to apply the fungicide after the disease has already appeared, only to have them express their dissatisfaction a few weeks later if weather conditions do not change and the disease continues to persist," he says. While he sometimes feels as though he is fighting an up-hill battle, McIntosh looks to Prophesy fungicide to put an end to the brown patch issues his customers are seeing. 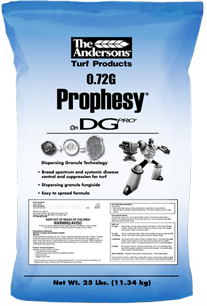 After dissatisfaction with other fungicide products, TurfMan has used Prophesy for years. "The other products we tried just did not do a good job of controlling brown patch," he explains. "Prophesy just does a better job on brown patch. Period." Prophesy provides multi-week residual disease control, coupled with strong economics, making it an ideal pillar for any summer disease program. The patented dispersible granular carrier allows for the active ingredient, propiconazole, to quickly go to work on mitigating disease progression. For more information on Prophesy, click here. In an effort to stay on top of brown patch control and help lawns recover, TurfMan put a curative program in place that combines Prophesy fungicide and straight fertilizers. Thanks to this combination, along with a string of recent cooler, dry weather, McIntosh is hopeful that the brown patch outbreak is behind them for the year. Although they've had success battling brown patch with a curative program, McIntosh doesn't want this to become the norm. "I can't ever see us not using a preventative fungicide program like Prophesy" he says. "We’ve had great success with this being a part of our Plus program, and our customers understand and appreciate the benefits this type of an application provides," he says.